The trace mineral strontium supports healthy osteoblast differentiation, osteoblast collagen formation and balanced osteoclast activity, maintaining bone tensile strength. In two separate clinical trials involving a total of more than 2,000 women, strontium supplementation supported healthy vertebrae integrity and composition. In a preliminary analysis of a three-year placebo-controlled, double blind study of 5,091 postmenopausal women, strontium supplementation promoted healthy hip bones. 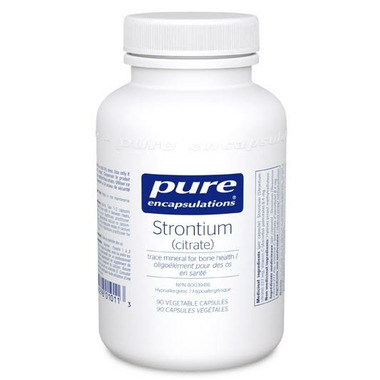 Since strontium is absorbed using calcium transport mechanisms, strontium supplements should not be taken at the same time as calcium supplements or calcium containing foods. While supplementing with strontium, adequate calcium intake should be maintained. Strontium promotes healthy osteoblast activity while maintaining healthy osteoclast activity to support healthy bones. Arrived really quickly- strontium vital for bone health and pure encapsulations is a really great product.